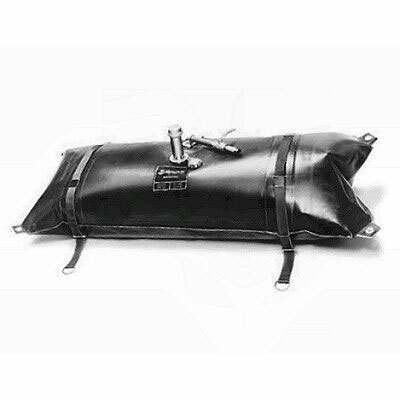 The Nauta model FT915180 tank can be used as a Holding tank or Diesel Fuel tank. This tank is not intended for use with gasoline. There are no fittings included with this tank. Fittings are required and can be purchased separately. The size and type of fittings should be determined by your use of the tank. You can purchase, locate and install the fittings according to your needs. A spanner wrench (FTP010) is included with this tank and is designed for fitting installation, removal and relocation. Diesel Fuel Storage Tank: NAUTA® flexible diesel tanks can dramatically extend the range of powered sail and motor boats. They can be deck or cockpit mounted to gravity feed (or be hand-pumped) to tankage below decks. And, when empty, these tanks can be rolled up and stowed. Sport and commercial fishermen heading into offshore waters and cruisers visiting remote ports (where refueling may be unavailable or of suspect quality) will find these NAUTA® tanks an ideal, low cost solution.